Up until now my focus on teaching my kids about money has been on establishing that work equals money and to save up their money for something they really want. I figured I would tackle invested when they got their first job and established a Roth IRA. 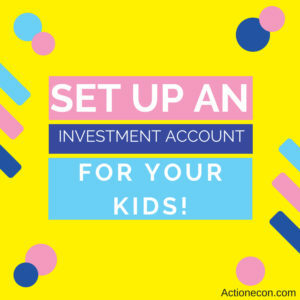 I’ve recently decided that needs to change and I started researching how to set up an investment account for your kids. I now feel that this is extremely important to get started now. Recently I watched a video clip from Dr. Boyce Watkins which changed my mind on my current approach. He said something to the effect of: Go ask a four year old what money is for. Most likely they will say “to buy stuff with”. this is a sign that you need to teach them more about money. We have a ton of adults walking around with that same mentality that money is only to buy stuff. Money has another important use and that is Capital. In looking for ways to teach my kids about investing I came across Stockpile. Stockpile is a great way to set up an investment account for your kids. Stockpile allows you to start investing with as little as $5. You can buy fractional shares, which makes entering the stock market and diversifying a lot easier. Look at Amazon as an example. Amazon stock trades at around $1,100 per share. With a traditional brokerage you would need to pay $1,100 to get into Amazon stock by buying one share. With stockpile you can buy $25 of Amazon stock if $25 is all you have to invest. Stockpile also makes it really simple to set up custodial accounts for minors. Stockpile charges 99 cent per trade; although this is inexpensive on a per trade basis, because you are buying fractional shares the total amount of money spent on acquiring 1 share can in the long run greatly exceed that of a traditional brokerage account. If you have several thousand dollars to invest then this is not the right account for you. I really like that Stockpile does not have any monthly account fees. I thought setting up my Betterment account was easy, setting up my Stockpile account took about 2 minutes. All they needed was for me to create a username and password, my date of birth, social security number, and to link a bank account. My only complaint with the set up process is that they didn’t have my primary credit union in their database of banks. I was able to add a secondary account that I use. I could see this being a show stopper for someone with only one bank account that isn’t in the database. The extra effort in setting up a bank account at another institution may discourage someone from proceeding to create an account. After setting up my account I was able to add all of the kids to set up an investing account for them. This took around 4 minutes total to add all 4 kids. 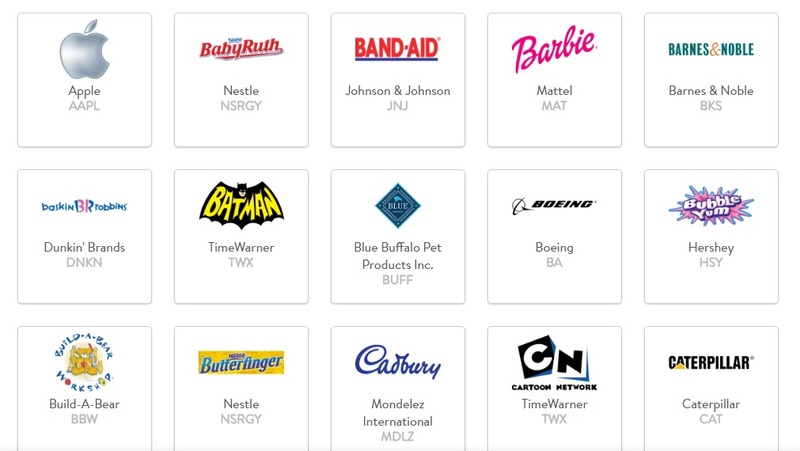 Stockpile allows you to search for stocks, and you can also browse for stocks by category. To make the process easy for children they show a picture of the company’s product with the stock symbol. You can also create a wishlist of stocks that you want to purchase. In addition to stocks they also have several mutual funds available. What I love about Stockpile is that they encourage people to give stocks as gifts. You can buy stock gift cards and send them to loved ones for Christmas, Birthdays, Graduations, or whatever reason you have. The buyer can choose cards that specify the stock, or you can gift a blank card that the recipient can choose which stock to invest in. Stockpile will also allow the recipient to redeem for a gift card of equal value if desired. The cost of the gift cards is $4.95 for $25 cards, $6.95 for $50 cards, and $7.95 for $100 cards. This is where Stockpile receives some criticism, because this amounts to a 20% fee at the $25 level, a 14% fee at the $50 level, and a 8% fee at the $100 level. You could bypass these fees by gifting cash to the recipient, who can put that money in his bank account and only pay 99 cents per trade. Critics opposed to these fees should also look at what happens with a typical gift card purchase. More often than not the recipient doesn’t use the entire balance. Over $1 billion in gift card balances go unused every year. Sometimes to avoid this people sell their gift cards on sites like Cardpool at a discount, often in excess of 10% of the face value. Otherwise, they purchase a toy which within a couple years will most likely be in a yard sale pile for a couple bucks, in a goodwill bin, or in the trash cart. Ultimately the total value of that gift will drop to $0, whereas $50 in Amazon stock or a Total Stock Market Index Fund will likely hold its value and grow over time. $50 in Amazon stock will certainly hold its value longer than another Batman castle . What’s more important than the value of the money in the account is that an investment account changes the way children will think about money. Getting them excited about building wealth and owning companies that they consume products of is extremely important. Changing the viewpoint that money is used to buy stuff to money is used to build wealth through capital is a major turning point. To me stockpile is an excellent educational tool and a stepping stone into investing. It is an excellent platform for children with no earnings. I still think establishing a Roth IRA once your kids have earnings is a better solution than a taxable account, because it is much more likely that Roths will remain tax free than the capital gains tax rate will remain at 0%. Stockpile should not be a primary tool for adults to use to get started investing, because most adults have earned income and using tax advantaged accounts for investing makes more sense. To use a Roth IRA your child needs to have earnings, which can be from self employment activities, BUT NOT from performing household chores. Your child can contribute up to their entire gross income OR $5,500, whichever is lower. Transferring an Account: The account transfer fee is relatively high at $75. I think I have paid around $40 for account transfers in the past. This may be a relatively high percentage of the account for my oldest child when he switches to primarily investing in a Roth, but for the rest of the kids this fee won’t be a major problem when they grow out of this account. If the fees for stockpile are too high for your tastes and you plan on investing more than 50 bucks here or there, You will want to go through a company like Vanguard and set up an account called a UGMA or Universal Gift To Minors Act Account. This is what stockpile does, however they add in the benefits of making it easy for anyone to contribute to the account and the ability to buy individual stocks with fractional shares. For a UGMA account you will be able to contribute up to $15,000 per person per year (so a married couple can contribute $30,000 to a child’s investment account), without incurring gift taxes. These funds will then be in the child’s name. The main consideration with this is the affect it will have on college financial aid because the financial aid formula expects students to pay 20% of assets and parents to pay around 5% of assets outside of retirement accounts and home equity towards college. You also want to be aware of taxes that may be owed if the holdings in this account generate income, since it is not a tax protected account. In my article Building Generational Wealth I talk about my plan for setting up investment accounts for my grandchildren when they are born. I’ve done a considerable amount of research on this and if I am able to contribute $16,000 at birth it should grow to being around $64,000 when they become adults and over $1 million before they reach retirement age. Setting up an investment account for your kids or grandkids is the best way to put compounding interest on your side and build real generational wealth. You might be concerned that since this is a taxable brokerage account taxes will be complicated. According to IRS publication 929 dependents can have up to $1,050 in unearned income before they have to file a tax return. Even if your children are heavily invested in high divided stocks, they would need to have over $25,000 invested with a 4% dividend yield in order to hit this number. For most families I don’t think taxes will be an issue. I don’t plan on my kids stockpile accounts becoming worth more than a couple thousand dollars. If you are able to contribute an amount that could exceed $25,000 total while your children are minors and you want to avoid them having to file a tax return then it is imperative to invest the funds in mutual funds that pay a very low dividend. A good example is the Vanguard Mid Cap Index Fund which has a dividend yield of 1.4%. You would need to have $75,000 in this account before it would yield the $1,050 in dividends that would require your child to file a tax return. Currently the long term capital gains rate is 0% for people in the 10% and 15% bracket. When your child becomes an adult and claims himself on his taxes he will most likely be in this bracket. It would then make sense to either sell off the positions he has (after not buying any new stock in the account for 1 year) and then re-investing that money in a Roth IRA. If your child has any earned income at all I would highly recommend reading the book The Kid’s ROTH IRA Handbook and setting them up a Roth IRA right away. Stockpile is a better tool for kids with infrequent, and often gifted income. If it is at all possible to take advantage of a Roth IRA that is the best option. I don’t know about you, but my kids have too much stuff. When our oldest was little we had no money and instead of getting a couple expensive new toys we would often pick up toys at thrift stores and yard sales whenever there was a really good deal. We’ve gone away from that now, but a lot of those toys still remain. We have a blended family so there are extra uncles and aunts and grandparents, etc, all who want to get the kids something for their birthdays and Christmas. I think last Christmas our kids averaged about 20 presents each, which is insane to me. It’s stimulus overload. Add in the age gaps our kids have and its only been this last year that we’ve actually gotten rid of any substantial amount of toys. As 1 kid outgrows toys they have tended to get passed down to the next kid. We just went through the kids rooms to get rid of toys they have outgrown and I was so proud of these kids. Our 4 year old got rid of almost a third of his toys (by volume). I don’t think we are the only family that has reach a point where there are simply too many toys. This is why I think stock gifts are a great present idea. They can be combined with a small toy so the kids have something to play with, maybe a Mickey mouse stuffed animal for the little kid paired with 50 bucks of Disney stock, or a small model car for an older child with $50 in Tesla stock. Not only can we teach our kids about investing, we can also start to ween them off of their super materialistic tendencies. If you want to change your family tree next to getting your own finances in order educating your children is the most important step you can take. There is no better way to educate them than to let them participate in investing. I wish that something like this existed when I was a kid. This Christmas, instead of having each child receive a mountain of toys, cut back a little and spend some of that money building them capital (as well as some on giving). The best gift you can give is setting up an investment account for your kids. What do you think about setting up an investment account for your kids? What do you think of Stockpile? 3 Responses to "How To Set Up An Investment Account For Your Kids (And Why You Need To)"
Good post, John. This topic is on my mind often as we have a 4 year old. Stockpile and Ramsey’s Legacy book are new to me. Thank you for sharing. This is an interesting find John. I had previously used oneshare.com for real 1 share stock certificates. (although they appear to be out of business, although giveashare.com does the same thing) The costs here are a lot lower. One question, though: to carry through the idea of this as a lesson, rather than just alternative savings, how do you think of this vs. a more entrepreneurial use of money, like having a lemonade stand, or an eBay or etsy store? (or even a garage sale) While I do want my son to invest in the stock market, I think seeing a whole (bite-size) business proceed also wraps in further lessons about why businesses need money. I think teaching entrepreneurship goes hand in hand with this, stock investing and starting a business are two pieces to the same puzzle. I think it is highly important to teach kids how to start a business, especially if they are excited to do so at a young age. (Then they can re-invest that money into the business or into stocks). All part of a larger picture of good financial management and wealth building.